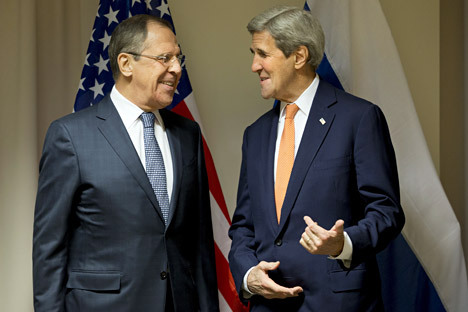 Russian Foreign Minister Sergei Lavrov and U.S. Secretary of State John Kerry discussed the issues of coordinating actions in Syria in the anti-terrorist direction; the United States has made several proposals. "The most important issue we spoke of is coordination, primarily in anti-terrorist actions. The American side has made several proposals, including with due account of the telephone conversations between President Putin and President Obama, my contacts with John Kerry and the contacts between the [Russian] Defense Ministry and the Pentagon," Lavrov said after the talks with the U.S. state secretary in Zurich. "These proposals [put forward by the U.S.] are made in the right direction in principle," Lavrov said. Meanwhile, the Russian foreign minister said that "the practical implementation of joint actions, division of labor, if you want so, mutual support in fighting terrorists, still remain our task." "We can find here much more effective agreements than just a memorandum, which is valid and is devoted to the procedures which allow for avoidance of unexpected incidents," the Russian minister said. He noted that "the anti-terrorist direction remains among the central ones on the Syrian front."